Aside from professional experience and academic credentials, salary structures and wages in the Philippines are determined by factors such as nature of work, workplace location, working hours, type of industry/sector, and others. The salaries of those working in major cities and business districts are relatively higher compared to those employed in second-tier cities and provincial areas around the country. Philippine laws, however, grant fair compensations and benefits to all types of employees regardless of differentiating factors such as those previously mentioned. Among these compensations and benefits are minimum wages, the thirteenth-month pay, health and insurance benefits, and holiday pays. The Department of Labor and Employment (DOLE) and its affiliate agency, the National Wages and Productivity Commission (NWPC), are mandated to enforce the provisions of the Labor Code of the Philippines – which prescribes employment regulations and labor laws for companies operating in the Philippines. 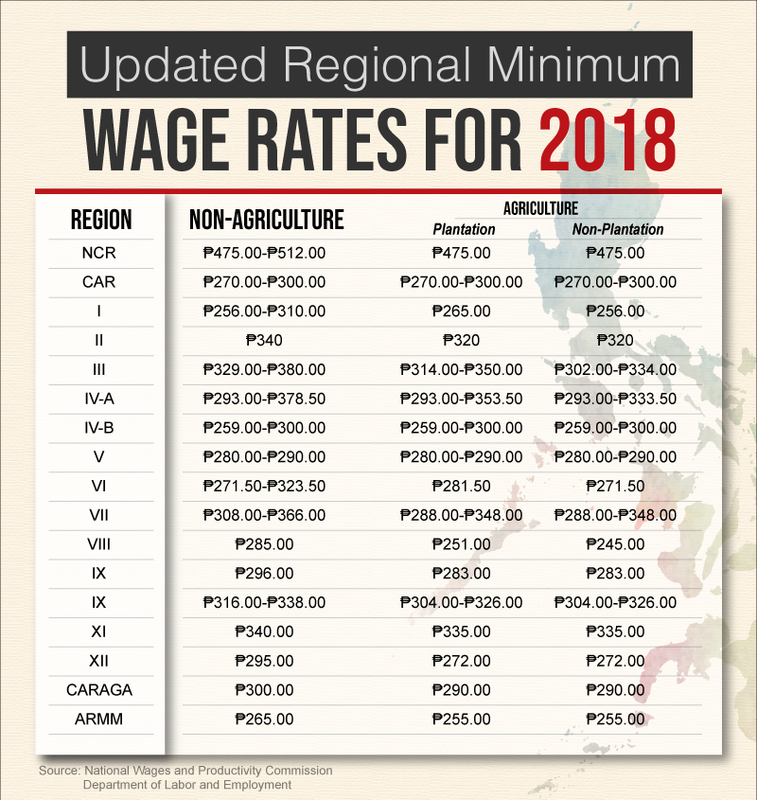 Minimum wage rates in the Philippines vary in every region, with a Regional Tripartite Wages and Productivity Board (RTWPB) in each of them to monitor economic activities and adjust minimum wages based on the region’s growth rate, unemployment rate, and other factors. In early 2018, NWPC released an updated summary of regional daily minimum wage rates to serve as a guide for employers on the minimum daily amount legally required for them to pay their employees.